No one knows exactly why, but there appears to be an increase in the number of people with asthma, allergic rhinitis, and food allergies. But there are treatments available that mean allergy sufferers don't have to be miserable. Jim Mark Ingram, MD, a pediatrician and allergist with the Little Rock Allergy & Asthma Clinic, tells his patients there are three ways to treat allergic rhinitis: First, avoid what you are allergic to with common sense ideas such as keeping your car windows up, keeping your house windows down, and otherwise staying away from what you are allergic to. Second is taking medication to suppress the symptoms. Third is allergy immunotherapy which is available either as allergy shots or sublingual tablets. "Immunotherapy can be curative over time," Ingram said. "Eventually, they can get off the immunotherapy and their allergies don't come back. But it is not a quick fix. It is not a magic wand. It takes effort. It takes time. But you can change your immune system to where it is not allergic to what it was before." Ingram normally sees an increase in patient load in the springtime because of tree pollen exposure. This year with the mild winter and early spring, he expects the higher patient load will occur earlier. But that doesn't mean that the season will last longer. There are many other types of allergens such as grass when it starts pollinating in April and May, indoor and outdoor mold, and dust mites. Fortunately, there are inexpensive over-the-counter (OTC) remedies that are quite effective. "Most of the good allergy treatments now are OTC whether Claritin, Zyrtec or Allegra, which are all non-drowsy, once-a-day treatments," Ingram said. "You can still work and use these medications. A lot of the nasal steroid sprays are OTC now. They are the gold standard for allergic rhinitis. There are some prescriptions we use if the OTC medications aren't working, but we are using the OTC medications more and more for allergies." Ingram said while OTC medications are good, he likens the action to that of a lid on a pot of boiling water. Immunotherapy, by contrast, is like turning the fire off and going straight to the source of the problem. "Usually within a few months you can see benefits from immunotherapy," he said. One mistake he sees every day is patient non-compliance with medical advice. Missing medications is the number one reason people suffer. People also often fail to avoid allergens like cigarette smoke, pet dander, dust mites, chemicals, etc. Ingram said indoor air filters are good for pet dander and for pollen that happens to get in the house. But they don't really help with dust mites or other irritants. "They can't hurt, but a lot of time they might not help that much," he said. Ingram gets a lot of questions from patients about gluten, dairy and other food allergies. He tells them there is a lot of difference between being gluten sensitive, which causes a lot of GI symptoms, and having food allergies where exposure to that food might cause more serious problems like anaphylactic shock. People with food allergies would love to take immunotherapy and be able to eat those foods again. Ingram said while there are studies ongoing for food allergy oral immunotherapy, there is a fine line between treating the allergies and causing anaphylactic reactions. "That is why there are no allergy shots for food allergies," Ingram said. "It can lead to severe reactions or death. You don't see companies lining up to do those studies because of risk of causing a severe reaction. The best and only treatment for food intolerance or allergies is avoiding it." Ingram initially got interested in becoming an allergist when doing a residency in pediatrics at Arkansas Children's Hospital. 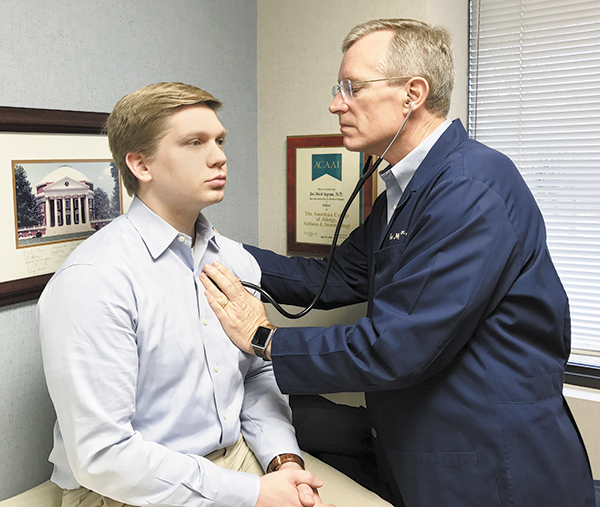 "While I was at Children's Hospital, my mentor was Dr. Wesley Burks, and he was an allergist and researcher into food allergies," Ingram said. "I just fell in love with allergy, asthma and immunology. After I finished at Arkansas Children's Hospital in 1992, I did a fellowship in allergy and immunology at the University of Virginia in Charlottesville. My mentors there were Dr. Tom Platts-Mills and Dr. Peter Heymann. I have been very blessed to be mentored by world-renowned allergists both at Children's and the University of Virginia. I feel honored to have learned from some of the best." Ingram grew up in Magnolia where his parents were educators. His mother taught history and his father was a basketball coach. "I grew up loving history and sports," Ingram said. He knew in high school he wanted to become a physician. He was an honors graduate with a BA in chemistry from Hendrix College before going to medical school. He met his wife, Allison Pounds Ingram, a pharmacist, at the University of Arkansas for Medical Sciences (UAMS) when he was in medical school and she was in pharmacy school. Ingram graduated from the UAMS College of Medicine in 1989. He joined the Little Rock Allergy & Asthma Clinic in 1994. His practice is limited to the diagnosis and treatment of allergic diseases and asthma in children and adults. Ingram has been very involved in the sporting activities of their four children by coaching baseball, basketball and volleyball. Their daughter, Ashley, is an all-state and all-American volleyball player. Their three sons, Austin, Alex, and Andrew, are all Eagle Scouts. Ingram was Boy Scoutmaster of Troop 30 in Little Rock for 3.5 years. The family is also very involved with their church, Immanuel Baptist in Little Rock, where Ingram is involved with mission work. He also does mission work for Young Life, a non-denominational Christian ministry that reaches out to adolescents through club meetings and camps.